1 Big Thing Separates Soft Magnetic Materials Vs. Non-Powder Metal. Many manufacturers have worked with the standard lamination steels for decades. Engineers know the obstacles associated with them, and they accept them as law. But the emergence of soft magnetic materials as a contender for use in auto and motor parts should not be ignored. Those seeking a truly unique, remarkable part may benefit from soft magnetic composite (SMC). How do SMCs compete with lamination steels? Let’s take a look. Spoiler: It’s only with SMC powder metal that you can reduce a product from 1,300 to 5. Soft magnetic composites are ferromagnetic powder particles ideally coated with a uniform layer of electrical insulating film. Parts formed from SMCs are squished together just like any traditional powder metal part. Soft magnetic materials are basically built for powder metallurgy. While traditional powdered metal parts are sintered (for DC applications), soft magnetic composites are low-temperature annealed (for AC applications). To simplify, this means soft magnetics are usually intended for an electrical function and traditional pressed/sintered parts have a structural function. Steel laminates, however, are NOT formed by a powder metal process. They instead come from a solid block of raw steel. Think of your bathroom or stovetop exhaust fan as an example. That motor has 6-7 laminations stacked in there. Each one is a little thinner to compensate for a laminate’s inability to form a rounded shape. Lamination steels have been around since the invention of electricity. Yet they have limitations. Think about a piece of sheet steel that's rolled thin and stamped. You’re limited to a 2-D shape. You can stack sheets to get a 3-D effect, but it’s still not true 3-D. Example: Say you need 100 laminations in your rounded part design. You have to make each one a little less wide than the previous. (Think of a toddler’s toy ring set.) This tends to make assembly complicated. Shuffling laminations together to make the right shape can be a huge pain. Another example: Look at this design. How would you be able to do that in lamination? There’s simply no way of holding it together easily. The complexity involved in making that shape is very high. A soft magnetic composite is not just a series of thin sheets. Instead it’s something that can become a truly unique shape. Creating a round component is easy with powdered metal. In fact, you can achieve it with a single press stroke! The design stage becomes much more efficient with SMCs in a case like the part above. You have that shape on the outside and a step-down region on the inside, followed by another tall shape on the inside. That’s almost impossible to do with lamination. It can be done with powder metal. You can wrap a copper wire around these parts quite nicely -- no air gaps! Air gaps don’t contribute to magnetic performance, so SMCs get rid of ’em. Soft magnetics allow engineers designing a motor or transformer to put metal where it’d be beneficial for the circuit. Because these composites are more compact than laminates, you’ll have fewer worries about height restrictions. 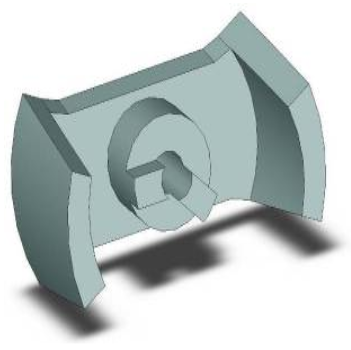 Low strength of final material: There will be limited applications for a rotating component. Less permeable than lamination: Permeability will be density-dependent, and you need greater current to achieve the same level of magnetic induction. Lower magnetic saturation than lamination. Note that a slower press run doesn’t necessarily mean powder metal is less time-efficient than lamination. Yes, lamination presses run very fast (100s of strokes a minute), but if you need 100 laminations to make an assembly, the single-press stroke powder metal process may still be quicker. It depends on the design. Also note that the more linear response of a soft magnetic might actually be an advantage in some applications. By far the biggest factor that separates soft magnetic composite from a laminate is the former’s 3-D shape making capability. Your design will use fewer and more manufacturable parts, taking your cost-efficiency to the next level. Every component we make at Horizon Technology is of this make. Certain current motors and other designs may not ideal for soft magnetic composite right now. But if you want to optimize your next design, powder metal is waiting. 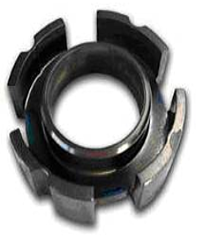 You can even combine soft magnetic composite with a laminate or sintered part. By thinking differently and not accepting the same-old, design possibilities open up exponentially. If you need more advice on how to convert a non-powder metal part into a powder metal one, feel free to get in touch with us.